Robert Piguet will launch the Pacific Collection, a trio of fragrances "inspired by the lush beauty of the Pacific", this fall. Blossom, Chai and Jeunesse were developed by perfumer Aurelien Guichard. Blossom ~ featuring orange, neroli, orange blossom,bitter orange leaves and musk. Chai ~ with bergamot leaves, orange blossom, white tea, honey and yerbamate. Jeunesse ~ the notes include blackcurrant, raspberries, pomegranate and musk. 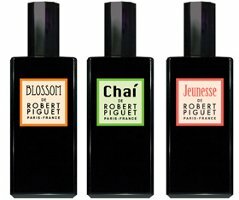 Robert Piguet Blossom, Chai and Jeunesse will be available in 100 ml Eau de Parfum. Robert Piguet has been BUSY lately! I’d like to try the Chai, not sure about the other two. My thoughts, exactly! Not sure about white tea in a chai, though. Worries me that the tea note won’t be as strong/dark as I’d like it. White tea? Ya, this went from ‘omgosh!’ to ‘oh ok’ a little bit. Why white tea?:(. Funny, I was coming here to post the same thing. They’ve suddenly released more new scents than the number of classics they’re so well known for?! Jeunesse means youth, correct? And youth means Berry Musk? I’m reading in the press release that it’s “a line specifically designed for and inspired by Asian Pacific consumers”. But they also say “arriving stateside at Bergdorf “, so it’s a limited release, but not really? I don’t know if they will be widely distributed or not, sorry. I’d love all of them in a 15ml set. I don’t often need 100ml of anything these days, but they do sound lovely for summer/autumn. Agreed that Piguet has been prolific lately. 15 ml would be perfect. If you click on his name in the article, you’ll see his perfumes — at least, the ones I know about. I want to try chai! Maybe these are as potent as FRACAS. I adored that in the late ’90’s. I want the last one. Maybe these will be great, but I can’t help thinking that they sound a bit tame for the house that brought us Fracas, Bandit, and the original Visa. Then again, perhaps that’s the idea? And agree that white tea in chai is just weird.